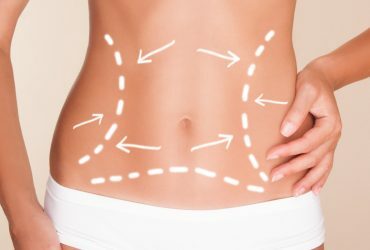 Non-Surgical Body Contouring: Introduction of a New Non-Invasive Device for Long-Term Localized Fat Reduction and Cellulite Improvement Using Controlled, Suction Coupled, Radiofrequency Heating and High Voltage Ultra-Short Electrical Pulses. To evaluate the safety and efficacy of a new and novel radiofrequency (RF) device used for focal fat reduction. 24 female and 1 male patients were enrolled in the study. The age range of the patients was 28-62 years old and an average BMI was 26. All patients underwent focal shape correction, without anticipating any weight reduction and 14/24 patients also had posterior or anterior grade 2 or 3 thigh cellulite treated. The patients underwent a 6-treatment protocol where they were treated with a novel RF device on the abdominal and flank regions once a week over a period of 6 weeks. 14 patients also had cellulite on their posterior or anterior thigh treated with the same device and a 6-treatment, once weekly protocol. Therapeutic thermal end points for each treatment were established and achieved as outlined in the paper. The RF device emits both basic RF and ultra-short High Voltage Pulsing (HVP). All patients and zones were treated once per week for 6 weeks. circumferential measurements were taken. 3 patients who were scheduled for future abdominoplasty surgery had Investigational Review Board compliant lower abdominal subcutaneous biopsies performed at 72 hours and 14 days following their initial RF treatment. The average circumferential reduction was 3.58 cm with range of 1.5 cm-4.4 cm. There were no non-responders observed in the study. Using the modified Nurnberger-Muller 7 stage cellulite grading system, the average cellulite score improved 2 sub-grades. Using the Vectra 3D imaging device and cellulite scoring software, the average starting pit depth was 4.1 mm (range 0.5 mm-7.3 mm). Average Vectra measured improvement in the pit depth or “smoothness score” was 2.9 mm or 60% (range 1.1 mm-6.3 mm). Biopsies revealed histological evidence of the death of proportion fat cells by apoptosis. There were no complications that required medical management. We conclude that the TiteFX appears to offer a safe and effective option for the non-invasive management of both focal fat excess and cellulite. The basic RF and High Voltage pulses appear to result in a long-term, proportional death of fat tissue, presumably through adipocyte apoptosis.